Trained by the Wright Brothers at a rate of $1 per hour, Bernard Whelan toured the country as an exhibition flyer, helping make America aviation conscious. At the outbreak of World War I, he became a civilian instructor for the budding Army Air Corps then a part of the Signal Corps. At the war’s end he joined Howard Rinehart as test pilots at the Dayton-Wright Airplane Company on Springboro Pike flying the DeHavilland DH-4 airplane. On May 22, 1921 test pilot Whelan set an altitude record of 19,710 feet flying a Dayton-Wright OW.1 Aerial Coupe, a four seat touring aircraft. The Aerial Coupe reached the record altitude after a 2 hr. 31 minute flight over Dayton. Because it was the last aircraft designed by Orville Wright, the airplane design was given the name OW.1. In 1923 the two men formed the Rinehart-Whelan Company establishing a pioneering charter service carrying passengers on cross-country trips, training and photography from their airport called the Moraine Flying Field. Quick publication of the epic pictures of the crash of the dirigible Shenandoah in the nation’s newspapers in 1925 was made possible to the derring-do of pilot Ben Whelan, who flew the photographic plates through a howling storm to make the deadline. In April 1926, Rinehart-Whelan offered to the City of Dayton, without cost, the Moraine Flying Field for use as a Municipal Flying Field for visiting commercial airplanes. In August 1926, Dayton City Manager F.O. Eichelberger agrees to have a sign painted on the hangar roof “Moraine Field, Dayton Municipal Airport” for a fee of $70. Although a resolution was prepared by Dayton’s Law Director and forwarded to Dayton Commissioners, Dayton does not sign an agreement to own, lease or operate the airport. 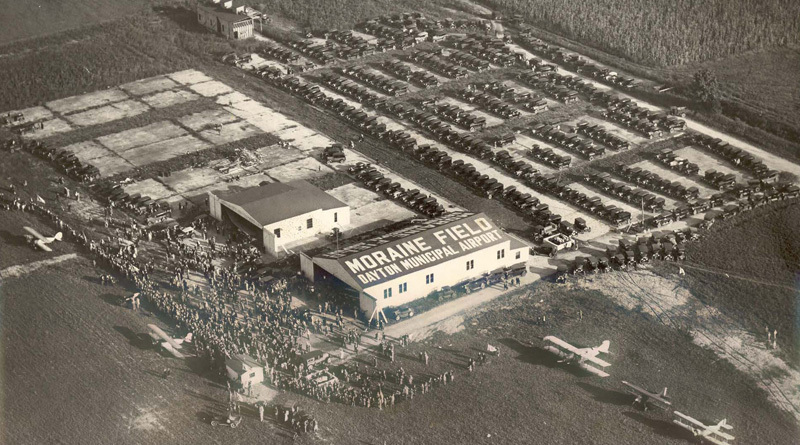 Moraine Field remains in private hands and serves as Dayton’s “official municipal airport” until 1928 when airmail service was switched to Wright Field in Dayton. Of interest was a 1928 letter from United States Consolidated Air Lines mailed to the Dayton Airport Committee. The letter stated that USCAL was expanding its rigid airship service to a selected group of cities in the coming year and suggested that Dayton’s Municipal Airport should not be “caught short” with a hangar or terminal station without a tall mooring mast to handle dirigibles or airships (which Moraine Field did not have at that time). Moraine Field was located about 150 yards east of the Springboro Pike/Northlawn Road intersection. The Moraine Historical Marker is located near there off of Springboro Pike at the entrance road to the Fuyao Plant.